Winchester Radio is a Charitable Incorporated Organisation (CIO), registered with the Charity Commission for England and Wales. Our registration number is 1160752. The CIO is a modern legal form of charity, especially created for small/medium-sized charities. Being a charity means that Winchester Radio cannot be highjacked by commercial interests. There are going to be no high salaries, and the Trustees (and their close family) can’t be paid at all. Anyone living locally will be able to join the charity and get involved – as an ordinary member, as a volunteer, as part of the management team, or as a Trustee – Radio for Winchester, from Winchester, by Winchester! the advancement of health and prevention or relief of sickness for the public benefit through the promotion of the benefits of living a healthy lifestyle, and the importance of maintaining good personal mental and physical health by (mainly, but not exclusively) the means of broadcasting health education messages to people living in the area served by the Hampshire Hospitals NHS Foundation Trust or its successors. The first of these has allowed Winchester Radio to be the successor, incorporated, charity to Winchester Hospital Radio, an unincorporated charity that provided a hospital radio service to the Royal Hampshire County Hospital from 1984 until the end of 2015 (you can read more about our heritage here). Our second charitable object allows us to provide a community radio service to the Winchester area, with the underlying aim of improving the health and wellbeing of local citizens. That doesn’t mean, however, that we’ll be doing nothing but talking about health. 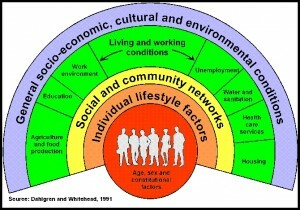 Diagrams from NHS Education for Scotland (top), and the LGA and RSPH (above), showing the determinants of health based on Dahlgren and Whitehead’s WHO-endorsed work. 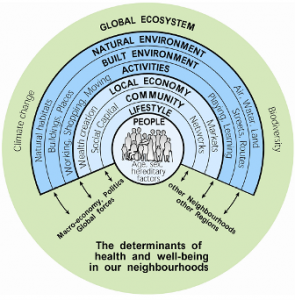 The WHO , the Royal Society for Public Health , the Department of Health , and the Local Government Association all endorse work identifying the determinants of health by Göran Dahlgren and Margaret Whitehead. Two variations of diagrams summarising their work are shown on the left. This work shows that the mental and physical health of people is affected by many things that the layman would not immediately associate with health. In addition to keeping fit and active, eating healthily, etc., health is also affected by the built and natural environment, the local community, housing, education, employment, etc. Thus, as well as encouraging people to directly look after their health through diet, fitness, sport, etc., health can be improved by encouraging people to engage in local civic society, the arts, volunteering, and other aspects of local life. To remain within our charitable remit, therefore, our programming does not need to focus just on what the local health services are doing, but can also legitimately include programming on other aspects of living a good life that indirectly affect one’s health and well-being and help reduce social isolation. And, of course, whilst our programming will be much more speech-based than the local commercial radio stations (and we hope you’ll find that interesting and informative), we will also be playing a great mix of music.